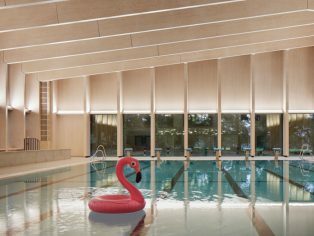 The new pool for City of London Freemen’s School, in Ashtead, Surrey, uses state-of-the-art timber construction and offsite fabrication methods to create a sustainable building that sits gently within its context. 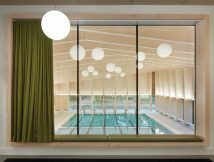 Designed by architects Hawkins\Brown, the 25 metre, six-lane competition-standard pool includes a multipurpose teaching and events space, as well as a panoramic view connecting the users with the surrounding woodland. Freemen’s School is a co-educational private school for day and boarding pupils, situated in Ashtead Park. Founded in 1854 in Brixton by the Corporation of London, its original purpose was to educate orphans of the ‘Freemen of the City.’ Having moved to Ashtead in 1926, the school is now set in 57 acres of parkland in the heart of Surrey. 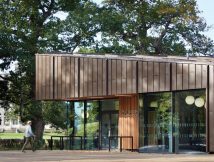 As part of a masterplan which included the renovation of several buildings across the school, the architects have created a new facility that blends well with this historic property, matching the site’s educational prestige and natural beauty. Mole Valley District Council granted outline planning permission for the masterplan in 2011. 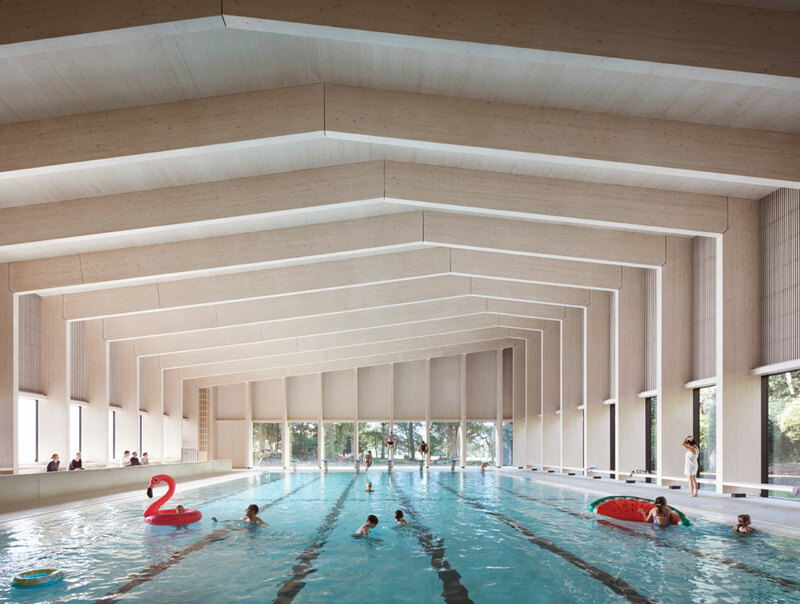 The new pool was a key part of the application, replacing its former iteration. Although originally planned for a later phase, priorities shifted when the old pool was destroyed by a fire in 2014. The architects utilised innovative offsite fabrication techniques to create the new building’s timber frame. The material palette complements the external setting – the building wrapped in zinc, creating a striking environment internally and externally for users and spectators alike. 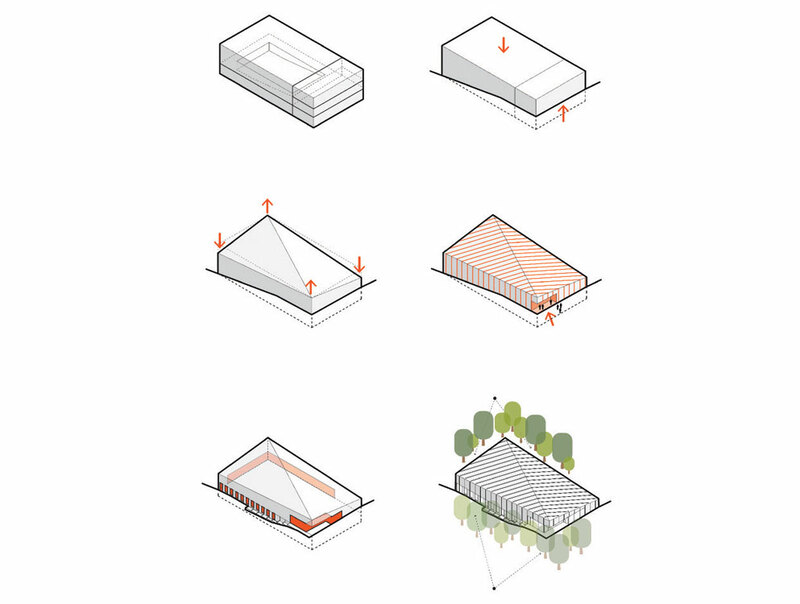 Hawkins\Brown architects were appointed in 2011 to undertake the masterplan for the school. Phase one was the design and delivery of the new music block and boarding accommodation, which was completed in 2014. 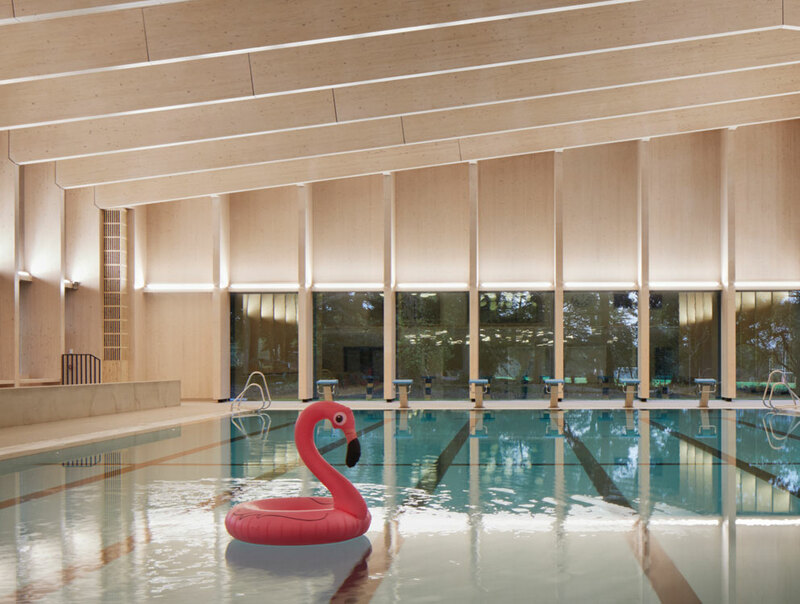 The swimming pool marks the second phase, and further phases move onto the large, Grade II listed main house, a new playground, and enhancements to the landscaping of the school grounds. This was not always the plan, however, as Adam Cossey, partner at the firm, explains: “The masterplan originally had four phases; the boarding accommodation and music school was to be phase one, the main house and dining area phase two, three was going to be the provision of an energy centre and a swimming pool, and phase four was going to be landscaping for the entire campus.” He continues: “However, the fire in their existing pool area, which was very close to the main house, catalysed the school to move on with the development of the swimming pool faster than planned, and so that became phase two.” Following this change, along with a new headmaster coming in, the masterplan was revisited: “The priority for the school was to replace the swimming pool as soon as possible. 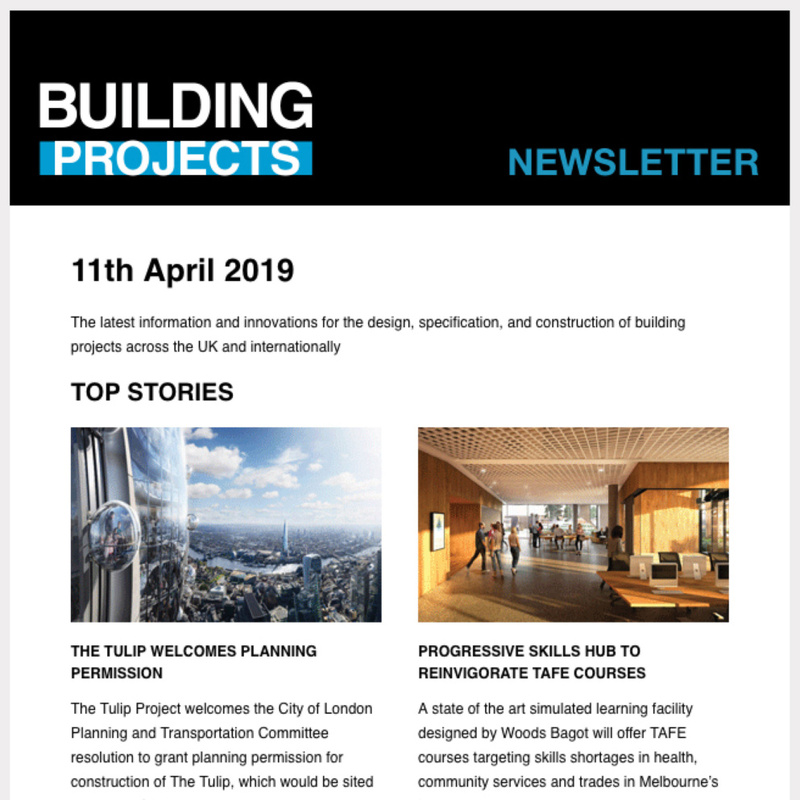 This provided an opportunity to re-evaluate the proposed location within the original masterplan and to consolidate the school’s sports facilities.” Another factor in the move was access. “If you’ve got a swimming gala you want to move vehicle traffic away from the academic heart, and encourage more pedestrianisation.” Working on a sensitive site, the architects and school had to think carefully about how to integrate the pool into the landscape once it was relocated. The building is positioned to minimise its impact upon the landscape and its visibility from the school’s main house. 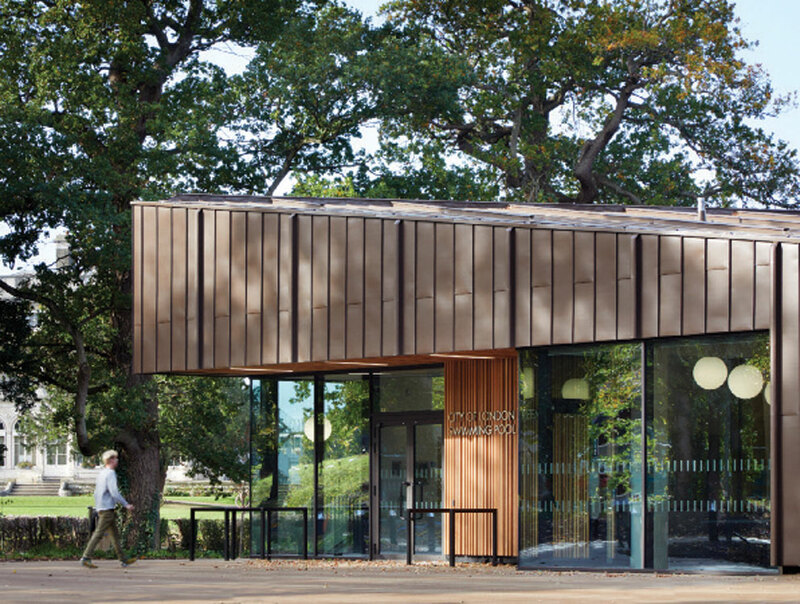 A partially submerged lower ground floor nestles the building into the landscape, while hand formed standing seam cladding in a dark copper colour responds to historic features of the main house, addressing issues raised by both the local planning authority and the conservation officer. “On paper, the conversation with the planning department seemed challenging, but after taking both the conservation officer and the chief planner around the building post completion, they were delighted with it.” The sloping gradient on one side of the site gave the architects “a fantastic opportunity to effectively give the pool an ‘upper ground’ and ‘lower ground,’” says Cossey. “By extending the pool at lower ground level, we were able to have wrap-around extended glazing on the north-east side of the building, producing an amazing view from the pool to the mature ancient oak woodland.” Also, on the upper level, and tying in with the main entrance on the upper ground where the property increases in height, they included an event space and classroom that overlooks the lower level of the pool. Inside the finished building, the architects designed a clear circulation, from the main entrance space and reception area on the upper level, following through to the classroom and event space. Views from both the event reception and event space into the pool are framed by deep window seats, along with blinds to achieve visual separation if necessary. A staircase leads down towards the pool, with doors on one side leading to the changing rooms and then the pool, and another door which leads into the spectator seating area. Glazing has been used around all four walls to flood the structure with light. “When it came to daylighting, we had to be cautious,” says Cossey, however. “We didn’t want glare on the water surface, because that would impede competition swimming.” The south facing glazing has an opaque finish, so there’s no chance of any direct sunlight onto the water. “What we can have, however, is indirect sunlight, i.e. from the north east facing elevations. We’ve got floor to ceiling glass on the lower level, and that allows plenty of daylight into the building.” On the upper levels, glazing wraps the event space, as well as the building’s main reception area. Swimming pools are frequently heavily serviced and environmentally controlled buildings. The final design of the Freemen’s School pool was developed to remain relatively free of services and the associated clutter. 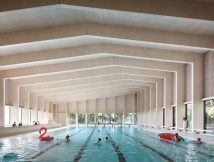 All of the environmental control systems, as well as the water treatment plant, are located around the perimeter of a subterranean base, which at its centre houses the pool itself. 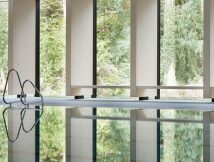 To introduce airflow into the hall, discreet slots are located in the floor beneath the glazing, reducing the condensation risk and evaporative heat loss from the pool. The design achieved a BREEAM Very Good rating – the building’s carbon emissions are reduced by 10 per cent thanks to roof PVs. Further carbon savings are planned later in the project, with the next phase of works on the main house to include a CHP energy centre that will utilise the pool as a heat sink. Environmentally-conscious products have been specified such as Foamglas insulation, which is made of recycled glass. 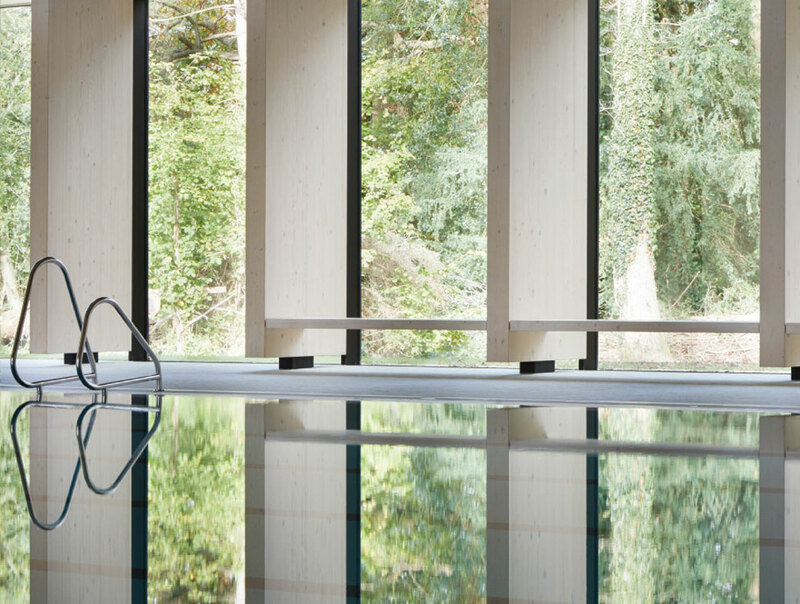 To minimise the building’s impact on the landscape, the swimming pool’s lower ground floor is partially submerged. This ‘beds’ the structure to some degree into the surrounding scenery, and preserves a large number of the existing trees, with the highest point of the gently pitched roof identifying the main entrance. The pool has an interesting geometry with slightly uneven elevations and a roof comprised of two triangular zinc sections. It resembles a rectangular box which has been slightly squashed at two corners and folded along its top. The ridge junction between the two triangles runs diagonally across the space, creating an offset, dynamic rhythm externally and internally, expressed in the CLT ‘ribs’ that hold up the structure. Adam explains how the building’s form was developed during the design process: “We began with the end requirements of the buildings. Then, we took a rectangle and extruded it, and you’ve got quite a conventional box, we then simply pushed down two adjacent corners of that box, and picked up the remaining two corners.” A standing seam zinc cladding in a dark copper colour was chosen to cover the building’s unconventional exterior, with seams forming vertical ribs which are intended to help the structure blend into the landscape. 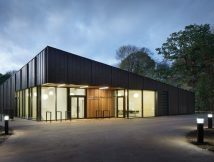 Another reason standing seam cladding was used is because it is a more traditional material, responding to key features of the school’s main house. Cossey notes the “fantastically collaborative” experience between the client, design team and contractor. He continues: “Where there were challenges, they were dealt with swiftly. From day one, there was a very positive, can-do mentality. It was an absolute pleasure to work with everyone involved.” Roland Martin, headmaster of the school, gave a glowing testimonial on the finished building: “We are overwhelmed by the beauty and quality of the new swimming pool – it is a fantastic new asset for the school and the local community. “We were impressed by the swift construction of the pool, and how it fits in the woodland space and complements the school as a whole.” It is not often that fires are a blessing in disguise, but it appears to be the case here, with the school now having a striking architectural asset for its students. Relocated to its proper location as one of the school’s sports facilities, and taking advantage of, as well as enhancing, its woodland location, it’s not hard to see why it has picked up RIBA South East and national awards. Lucky students and visitors will be able to ‘swim among the trees’ for decades to come.